Deliver your message with clarity and impact, while leveraging the strength of the WSU brand. University Marketing and Communications designs memorable displays for conferences, museums, campus focal points, event promotion, recruitment, and more. 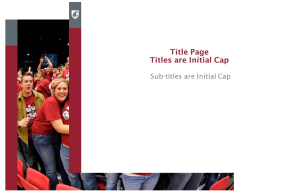 We support lectures with WSU-branded PowerPoint presentations that visually engage audiences and drive home key points. Download PowerPoint templates.